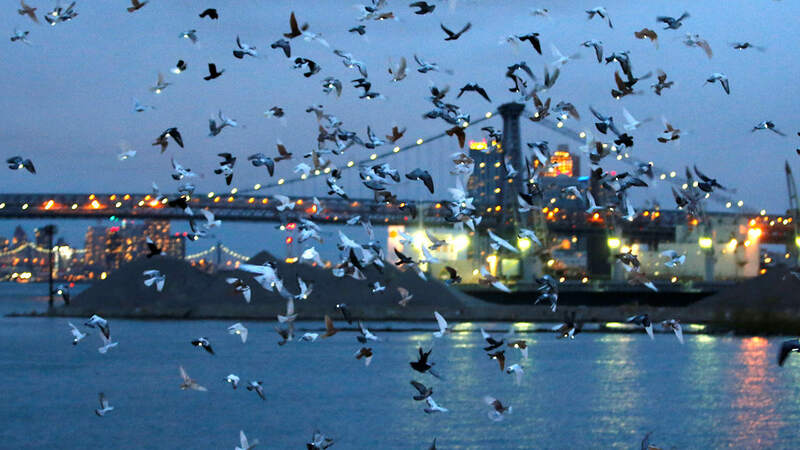 NEW YORK -- New York is staging a show with 2,000 pigeons tagged with LED lights illuminating the city's night sky. Then a hush descended on the scene as Riley and several assistants, hollering and blowing whistles, waved garbage bags - simulating hawks - over the vessel to start the flock flying around. Equipping thousands of pigeons with LED lights was a project unto itself - a team effort led by a company called 10xBETA based at the Navy Yard. It took a technician in China to create a pigeon-light circuit. And an American manufacturer made containers for the equipment that volunteers snapped into the leg bands.